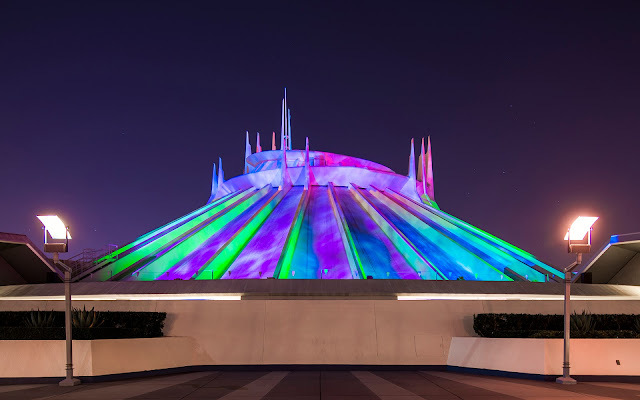 One thing that cannot be captured by any photograph of Space Mountain Ghost Galaxy is the creepy nighttime soundtrack that transforms the local ambiance from a futuristic space port to a haunted space station infected by an insidious interstellar spirit. Accompanying the hypnotic projections on the Space Mountain building is an eerie low bass of suspense, punctuated by random shrieks and loud crashes. Something is inside, something that should not be disturbed. But it clearly has, which has frightening implications. And of course, I love the ride all the more because of all of this! Space Mountain Ghost Galaxy, lit up in mysterious hues at night.